Halloween is a time for kids of all ages to dress up and load up on sweet treats. Enjoy colorful costumes and delicious goodies and celebrate Dia de los Muertos and Halloween in Sedona in style! View this year’s events below. Join us in the courtyards on Saturday, October 28th, 2017 from 2:00PM to 8:00PM. Make an offering at the Celebration of Dias de Los Muertos. Music, food, and beautiful altars will be on view. Watch fire dancers perform and visit out thematic face painting booths. Costumes are encouraged. Ofrenda or Offering, in the traditional Mexican celebration of Dia de Los Muertos, is created to remember the dead and to honor the ancestors. Stroll through the Day of the Dead themed Mercado. 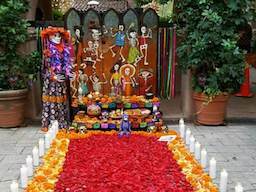 Enjoy free sugar skull making and peruse the decorated altars in the courtyards. Free trolley rides on Saturday 2:00PM to 8:00PM from the Uptown Municipal Parking Lot at 260 Schnebly Rd, Sedona Arizona. Join the Verde Valley ​​​​Humane Society at its Howl-O-Ween Pet Costume Contest at the shelter from 10:30 a.m. Contest entry fee is a $10 donation per pet and deadline to register is October 27. Owners and their pets will win fabulous first place prizes in the five categories, as well as a grand prize. For details and a registration form,visit verdevalleyhumanesociety.org or call 928.634.7387. Enjoy true stories about ghostly encounters and Halloween fun from our own backyard and around Arizona in this original show on October 28 at 3:00 p.m. at the Sedona Heritage Museum at 735 Jordan Road. Sedona author, cowboy poet, and actor Michael Peach will present a special and spooky performance of “Haunted History” with story titles like “The Hauntings of the Red Ghost”, “The Cactus Killer”, and “The Ghosts of Wilson Canyon”. Tickets cost $6, children under 12 are free. Call 928.282.7038. A “Beggars Ball Night” at Sound Bites Grill with Batrina and her cast of Ghosts and Beggars who try to unravel Who Done It? Tom and Shondra, Dev Ross and Brad Roberts will trick guests during the breakout scenes of scary hilarity! A four-course meal and a special appearance by “Thriller Dancers”. Win a prize for best costume. Arrive between 5:30 – 6:00 p.m. Cost is $75++ with social seating! Costumes are not required. Call 928.282.2713 or visit soundbitesgrill.com. Attend a free ghost hunt on October 30 led by Sedona UFO and Vortex Tours. The evening will begin at Full Moon Saloon at 5:00 p.m. for drink specials and complimentary pizza for the ghost hunters. At 7:00 p.m., local company, Sedona Driver, will be offering free caravan service to Pine Cemetery for the 60-minute ghost hunt. Afterwards, guests are invited back to Full Moon Saloon for a Monster Mash Karaoke Party. To sign up for the ghost hunt, call 513.680.8810.